In "How to Read an Invitation Part 1" we saw how to read the outside envelope to ascertain whom was invited to the event. 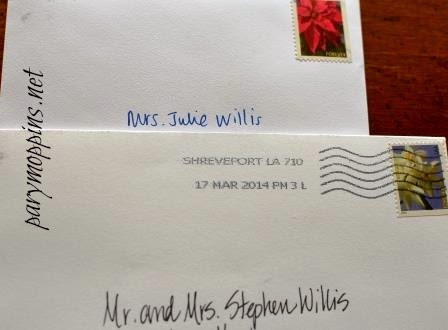 What about those invitations that have inserts or other enclosures like second envelopes or RSVP cards? With a formal invitation (wedding, graduation, anniversary party, etc.) there is an inner envelope with the names of the people specifically invited. Mr. & Mrs. Engineer Moppins means that only Engineer and I were invited and Diva gets a date night with her grandparents. Mr. & Mrs. Engineer Moppins & Diva Moppins means that we are all invited. Miss Diva Moppins & Guest means that Diva would be able to invite one other person to attend the event with her. Pary, what would happen if you had a baby and the baby's name wasn't listed? Good question. That would mean that Baby was not invited and they too get to have a date night with grandparents. The hosts are entitled to inviting or omitting whomever they choose for whatever reasons they choose - for better or for worse, it's their party. As for the R.S.V.P. cards, they too will be very clear. They will request a date by which you should respond. Sometimes, an invitation says "Regrets Only" which means respond only if you are not going to be in attendance. Otherwise, it's very important to respond whether or not you will be attending. The R.S.V.P. card will also leave space for the number that will be attending. By responding, you give the hosts plenty of notice to gather supplies, give the caterer numbers, hire the right number of babysitters, etc. If options are available, it will say so on the R.S.V.P. card. If the R.S.V.P. card does not state that options (vegetarian, children's meal, etc.) are available, then they are not. If the card states that options are available, that is your chance to make your preference known. Why is it important to R.S.V.P. for all who are attending by a certain date? Often the hosts have deadlines from caterers, vendors, and venues which require deposits. Your lack of R.S.V.P. could cost them money and time. Occasionally I help out with some friends' catering business. Oh, the stories I can tell you about all of the hoo-ha involved when people don't read their invitations properly. We have had to set up more tables, serve smaller portions, and stretch the wait staff because guests just showed up. Alternatively, we have had whole tables that sat empty (which meant wasted food, favors, publications, etc.) because guests didn't respond that they wouldn't be coming. We have also had the folks that ask the wait staff if there is a vegan or gluten-free option available...as the servers are bringing out the food. A good host will try to accommodate as best they can, but a good guest should never make them have to. YES. Thank you so much for clarifying this! People just think if an envelope comes to them they can bring everyone under the roof! What's interesting is that Engineer told me this morning that reading an envelope seems so simple - like making a budget. But just like spending less than you bring in seems like a no-brainer, unless you are taught the proper way to read an invitation or to budget, you just don't know.